Painting "The Ellipse" by Davis A. Buckley, 1987. An early idea for the location of the National Law Enforcement Officers Memorial. It has been 25 years since the National Law Enforcement Officers Memorial was dedicated on October 15, 1991, and with construction of the National Law Enforcement Museum underway, it only seems right to look back on the Memorial, the work that went into building it, and the significance it continues to hold. There were many things to consider in determining the location of the Memorial. It was to be in a prominent place, easily accessible for the public. It was also important that the National Law Enforcement Officers Memorial not be linked or associated with any of the numerous military memorials around the nation’s capital, as it served a distinct purpose. Early on, Craig Floyd, the first Executive Director (and current President and CEO), consulted with Jan Scruggs, the President and Founder of the Vietnam Veterans Memorial Fund (VVMF). Thanks to Mr. Scruggs, in many ways, the NLEOMF was able to follow the model of the VVMF in creating the National Law Enforcement Officers Memorial. 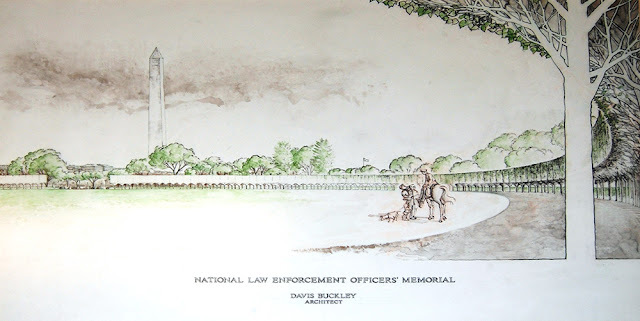 When Davis Buckley, the architect hired by NLEOMF, drew up his first designs for the memorial, he used the site of the Ellipse – the area between the Washington Monument and the White House – for his plans. This site was rejected by the National Capital Memorial Commission at the time, which eventually led to the choice of the Memorial’s current location in Judiciary Square. This site received final approval by the National Capital Planning Commission and the D.C. City Council in March of 1989. One unique element of the design is that it does not include a statue of a person. Instead, at the center of the memorial, is a bronze medallion with a shield and rose, surrounded by an ivy wreath. The shield incorporated the preference of many supporters who voiced that a badge should be featured in the memorial somewhere. The inclusion of the lion statues was deemed right and appropriate by all parties involved. Created by sculptor Ray Kaskey, four groups of lions and cubs at the entry points to the Pathways of Remembrance along the memorial walls, symbolize the protective role of law enforcement. According to Kaskey, “The idea of lions representing the virtues that we are trying to call forth here is very old…Throughout history…lions have been used to represent not only power, but also courage, protection, alertness. All of these things we wanted to put across with the symbolic representation in the Memorial.” The lion cubs are meant to represent the survivors and families of fallen officers, as well as the innocence of the general public whom law enforcement are charged with protecting. The trees and flowers in the landscaping are inviting year-round, and together are meant to represent the seasons of life, and cycles of birth and death. It is clear that every element of the National Law Enforcement Officers Memorial was carefully planned, and the feelings it evokes are no mere coincidence. Over the past 25 years this Memorial has truly served its purpose. It is a place to honor those who have died in the line of duty and for friends and family to remember lost loved ones. It is also an enjoyable, quiet space in the middle of the city for anyone who visits. Information on the National Law Enforcement Memorial taken from The Making of a Memorial by Connie Clark.